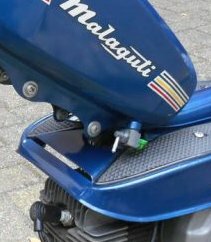 Malaguti is a family-owned motorcycle company based in San Lazzaro di Savena, Italy, founded by Antonio Malaguti in 1930. Antonio Malaguti was a well-known sportsman and racing cyclist. 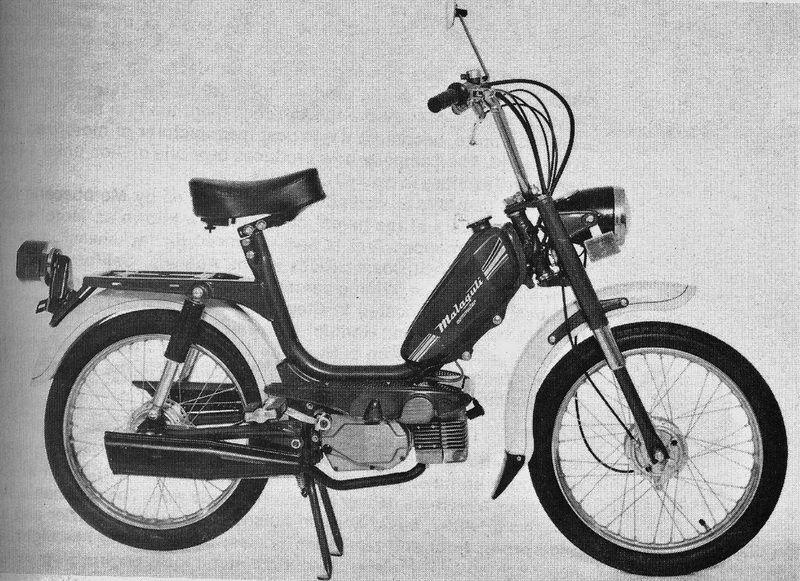 Malaguti Commuter was a US-model moped, one of the many successful products Malaguti made in the late 1970’s. These machines were originally imported to the US by Malaguti of America, 1851 Post Road, Warwick, Rhode Island USA. 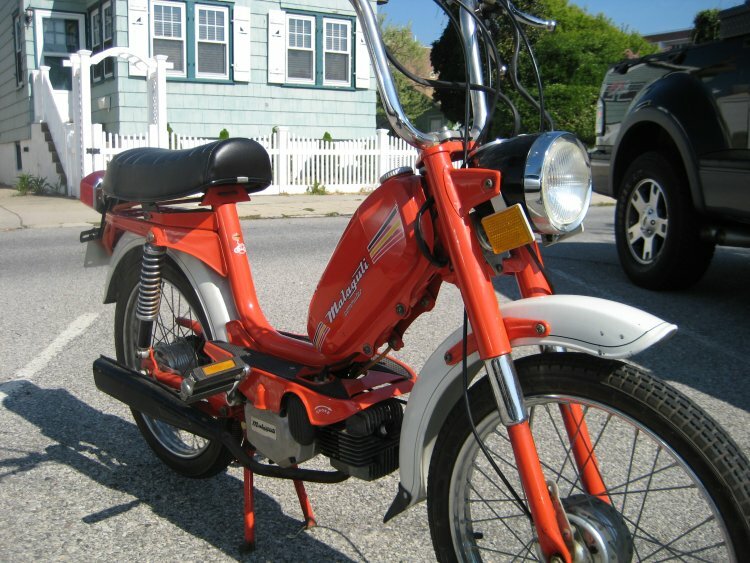 Around maybe 1982, when the moped boom was almost over, Marina Mobili Inc, in Moonachie, New Jersey USA, bought out the US inventory and the rights to continue to distribute the Malaguti Commuter mopeds. MMI continued the trade name “Malaguti of America”. Malaguti is not in the 1981 Moped Buyers Guide. In the 1977 book “Mopeds” by Paul Dupre there is one model, the Malaguti Commuter. The photos on the internet have dates of manufacture consistent with 1976 to 1980. 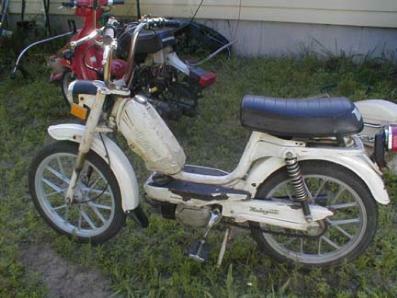 This is a typical date range for US model mopeds. 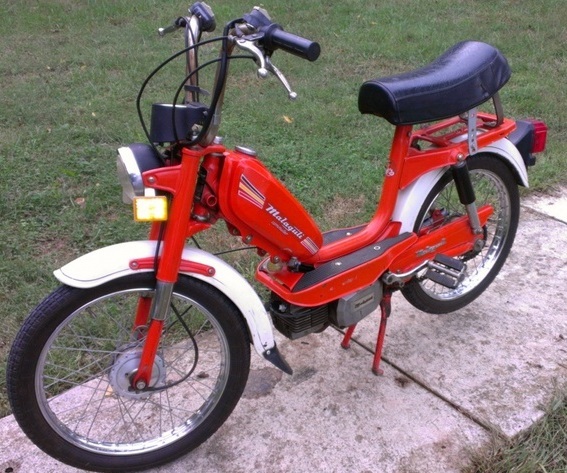 1976-77 models had a solo seat. 1977-80 had a long seat. 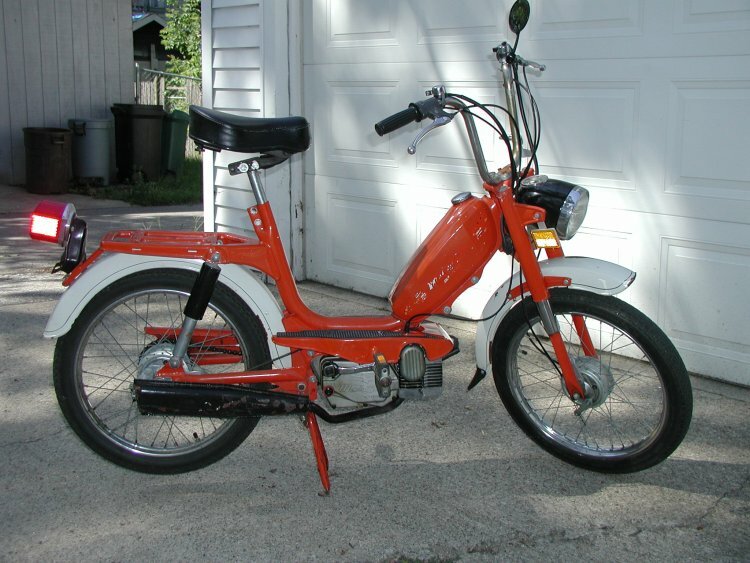 1976-78 models had a CEV 9350 large oval 1-bulb tail lamp, a CEV “bullet” large bucket head light with built-in speedometer, and CEV round chrome clamp-on handlebar switches. Canada models had different lights, switches, wiring and generator coils. 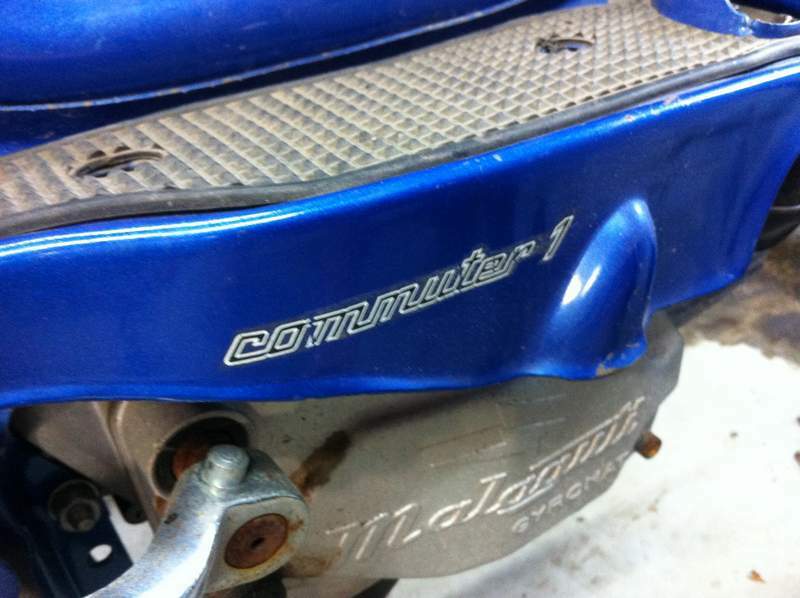 The gas tank stickers always said “Commuter” without any “1” or “2”. 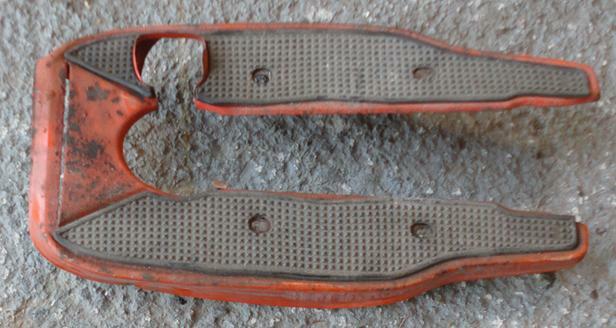 At first the floorboard sides said nothing. 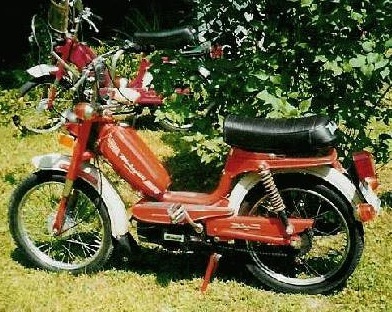 After early 1977 they said “Commuter 1” or “Commuter 2”. The ID plate was red and did not say the model. 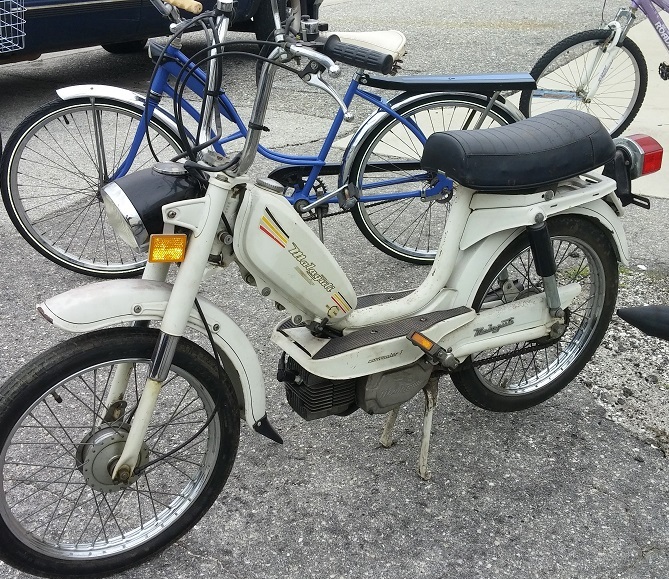 1979-80 models had a CEV 9400 rectangular 2-bulb tail lamp, a CEV small bucket headlight, handlebar-mounted Veglia speedometer, CEV black plastic sliding clamp-on handlebar switches. 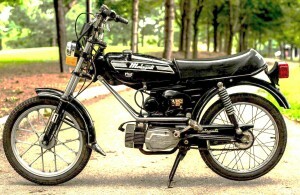 1980 models had a black Morini M1 reed valve engine. It produced more torque, for quicker acceleration. 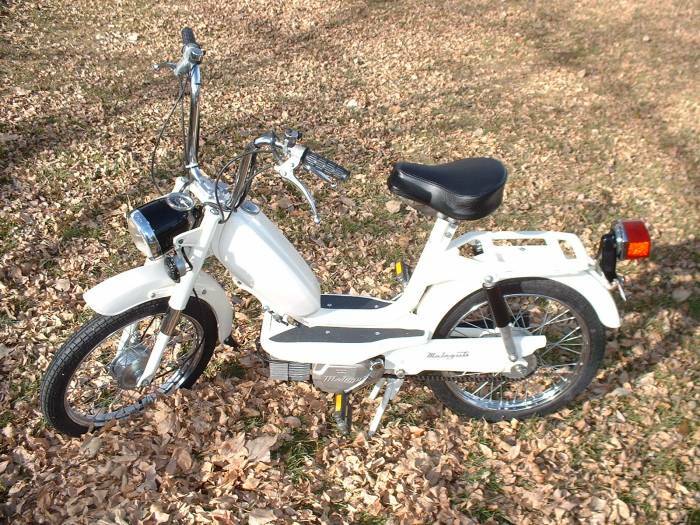 It climbed hills and accelerated as good as the MO-2 two-speed did. 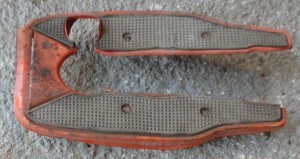 Malaguti floorboard is the same as Baretta. The carburetor hole has been cut to allow easy removal without disconnecting the throttle cable. 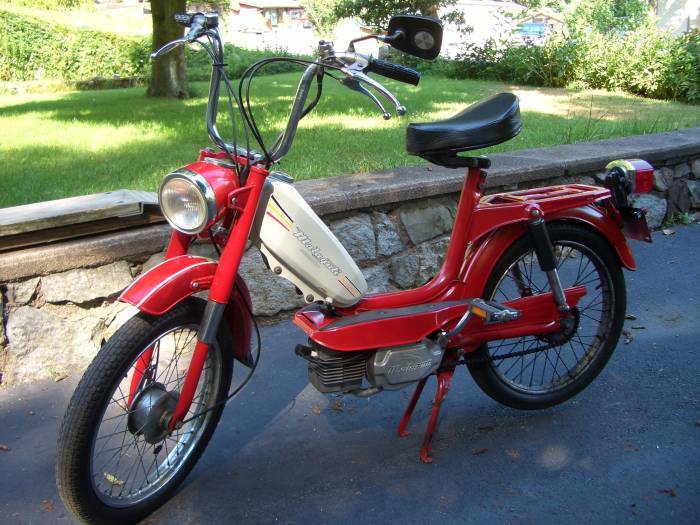 The three left photos A,B,C are Malaguti Commuters with Morini MO-1 Gyromat “side pull” engine. The start cable goes through the frame and pulls sideways. It enters the frame through a large hole on the left above the flywheel. The conduit stops at a small hole on the right. 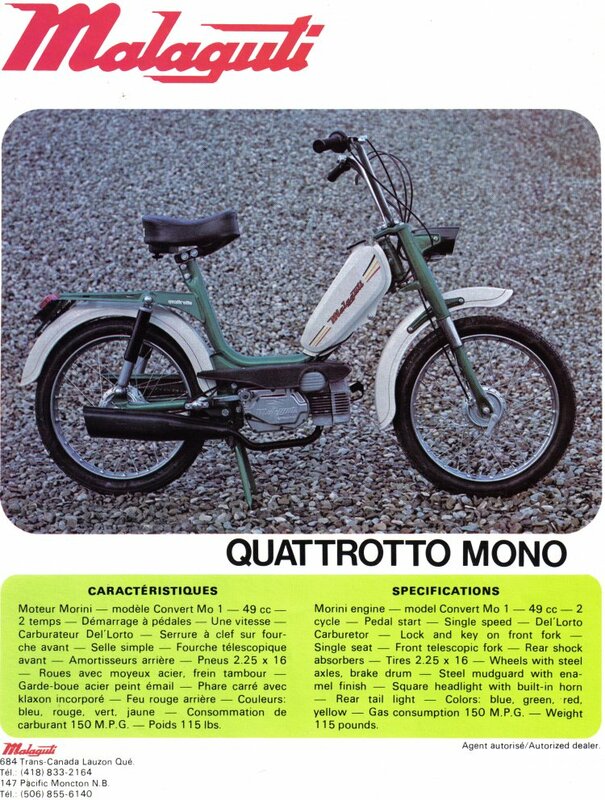 The two right photos D,E are non-Malaguti mopeds with Morini MO-1 Gyromat and non-Gyromat “front pull” engines. The start cable does not go through the frame. 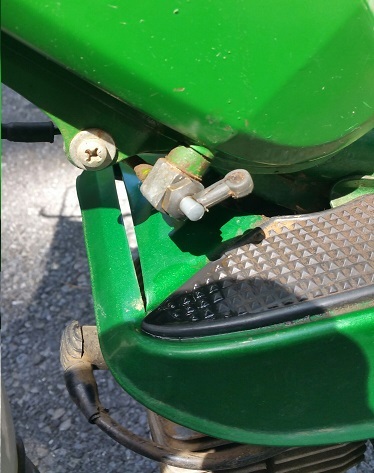 Instead it is “backwards” because the inner wire is fixed and the conduit moves with the start lever arm. 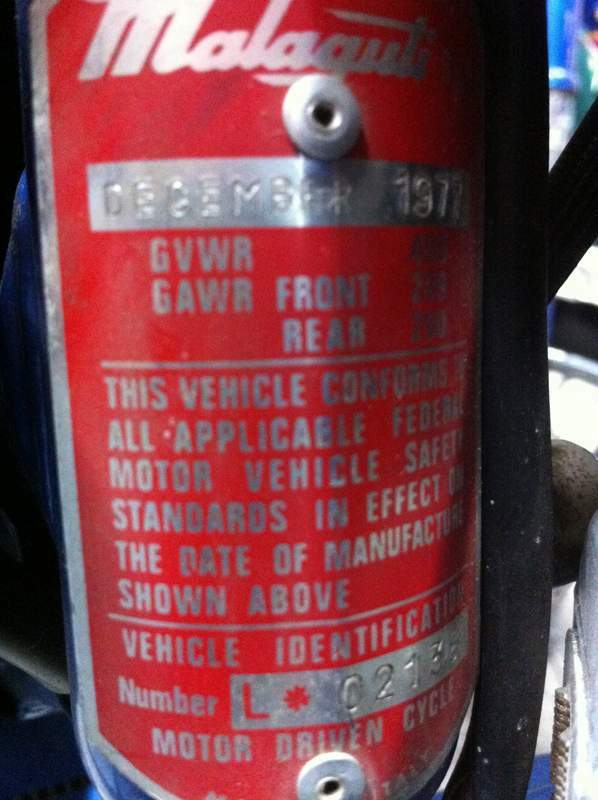 This also shows that some Gyromat branded MO-1 engines have side-pull type clutch covers, and some have forward-pull type clutch-transmission covers. 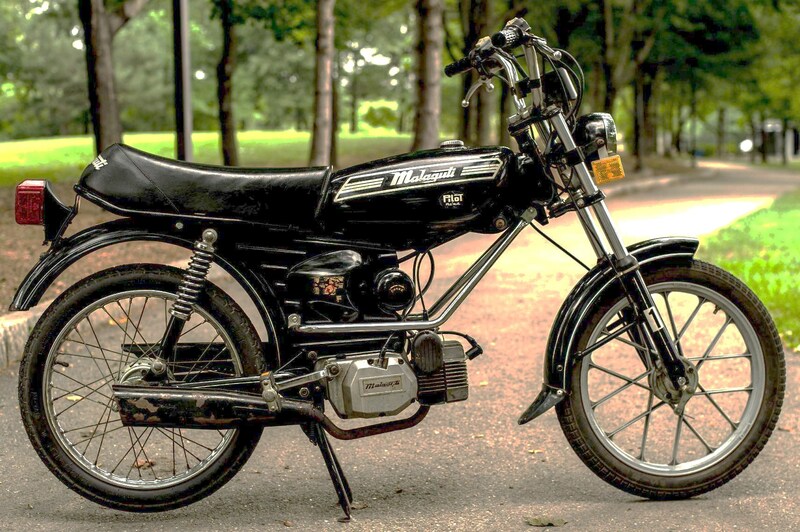 Malaguti components: 1976-79 Morini MO-1 Gyromat with side-pull start cable, or 1977-79 Morini MO-2 with internal start cable, or 1979-80 Morini M1 (black) engine with forward-pull start cable, Dellorto SHA 14/12 or 14/9 carburetor, Domino chrome levers/controls, CEV electrics, 2.25-16″ tires, Grimeca hubs and 90mm brakes, CEV or Veglia speedometer with LH driver. 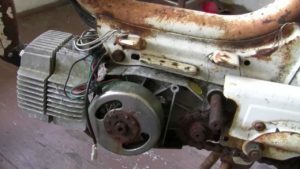 You are currently browsing the archives for the Malaguti Parts category.